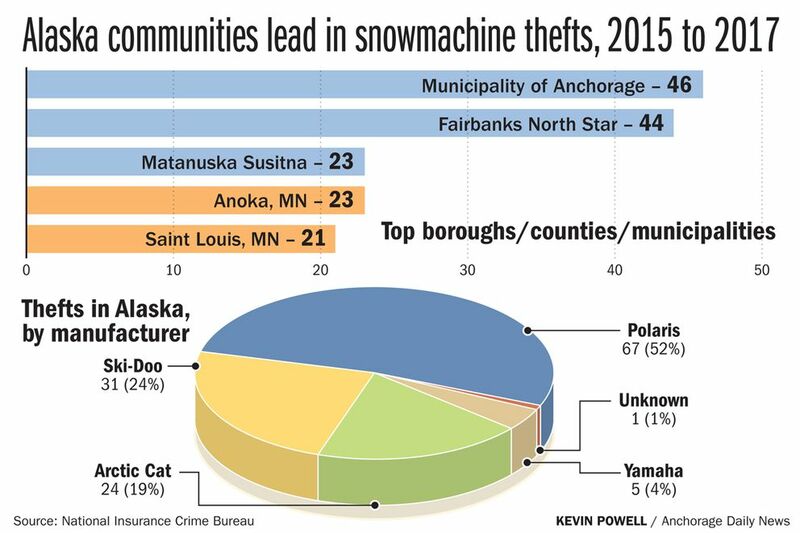 The top three geographic areas with the most reported snowmachine theft are in Alaska, according to a new national study. The study found that the Anchorage area was the top location nationwide for theft of snowmachines from 2015 to 2017. Following close behind: The Fairbanks North Star Borough. The Matanuska-Susitna Borough tied for third with Anoka County, Minnesota, outside Minneapolis. The Illinois-based National Insurance Crime Bureau released its first-ever analysis of snowmachine theft on Monday. The study used data reported to the National Crime Information Center, an FBI clearinghouse of crime data from law enforcement agencies. Nope. The results turned out to be pretty much what you’d expect, said Scafidi. The areas where snowmachine thefts happen are the areas where lots of people own lots of snowmachines. The numbers are still relatively small: In Alaska, there were 128 recorded thefts from 2015-2017. Of those, 46 came from Anchorage. In 2018, a year not included in the study, only five snowmachines were reported stolen to Anchorage police, according to spokeswoman Renee Oistad. 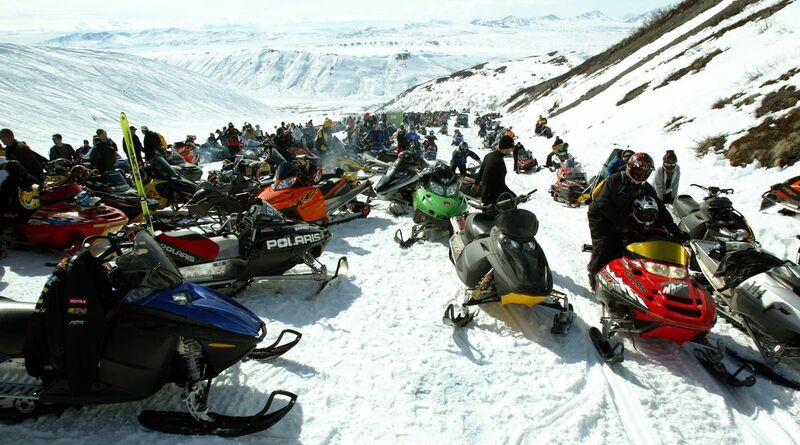 That Alaska sees many snowmachine thefts is no surprise, said Tim Cook, president of the Anchorage Snowmobile Club. • Despite its small population, Alaska ranked in the top five of overall number of reported snowmachine thefts by state. The top five were Minnesota, Michigan, Wisconsin, Alaska and Washington. Alaska made up 8 percent of all reported snowmachine thefts nationally during the three years of the study. • Most snowmachines are stolen during winter, between early December and the end of February. That’s no surprise because that’s when snowmachines are out and about being used, and the research also found they were frequently stolen off trailers en route to being used on a trail or while being stored. “Somebody will take the trailer and everything on it,” Scafidi said. • Nationally, 36 percent of all snowmachines reported stolen were Polaris brand. In Alaska, some 52 percent of all snowmachines reported stolen were Polaris brand. That one’s a bit of a mystery, said Scafidi. “Maybe people are stealing Polaris because their Ski-Doos are broken,” Cook quipped. • Law enforcement agencies in 32 of 50 states reported at least one stolen snowmachine -- even as far south as Texas and New Mexico. • Most of the time, when a snowmachine was stolen it hadn’t been recovered after two years. Cook, the club president, said he didn’t know what to make of the research. He didn’t think snowmachines were necessarily being stolen more often, but possibly in more brazen ways -- he’s heard of new snowmachines being driven off a dealer lot. And he knows of a neighbor who had his sled and trailer stolen from his front yard. “That was pretty bold,” he said. Theft may also be driven by the fact that snowmachines are a lot more expensive than they used to be. Parts, too, are expensive, he said -- leading to a secondary market for “parted out” snowmachines. One other element in Alaska: Snowmachines are not required to have a title, Cook said. “But they are supposed to be registered (with the state). And unfortunately we don’t register as many sleds as we should."